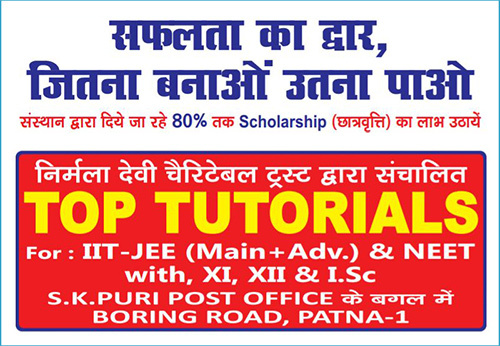 Top Tutorial in Patna, Bihar is the only coaching in Boring Road where Hindi Medium Classes are taken for students who are weak in English language. Students from interior cities of Bihar come for fulfilling their career dreams, but here in Patna, they get nervous with the language most faculties use while teaching. We at top tutorial, take very serious concern of this issue as our main motto is to make the basic understanding of the subject clear to the students. We use Hindi Medium teaching and we proudly affirm this. We have a success record of Minimum 80% marks in Bihar Board and minimum 90% marks in CBSE Board. Its our Guarantee. If you don’t believe, just visit our centre located near Sri Krishna Puri Post office, Boring Road, Patna or Call us at 7979009160, 9304998560. You will find it sure. Start studying before taking admission. Try and if you dislike then don’t pay any fee and move to coaching of your own choice. No compulsion at all. As IIT-JEE and NEET are top competitive exams at 12th standard level, our expert and experienced faculty use unmatched teaching methodology and tips and tricks which help the students get success easily in these exams. Core faculty team and guest faculty from top and renowned colleges and educational organizations visit Top tutorial in Boring Road, Patna for guiding our students regularly.